Home › News and Events › Company News › Proud Sponsors of the Weston-super-Half Marathon! 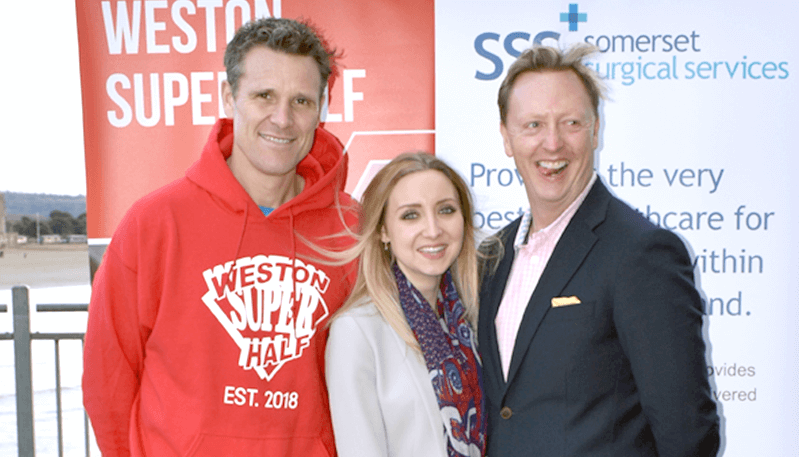 Somerset Surgical Services are delighted to announce official partnership with the Weston Super Half Marathon. In March 2018 Weston -super- Mare will host the Weston-super-half, organised by Olympic Champion James Cracknell – a 13.1 mile scenic route setting off from Marine Parade. At Somerset Surgical Services we are keen to promote healthy and active lifestyles whilst supporting our healthcare community. As a local company with employees and patients alike living in the Weston-super-Mare area we are proud to have the opportunity to support and sponsor such a positive event. Amongst the runners will be members of our own staff including Managing Director Mike Radford. We wish all participants the best of luck with their training and look forward to seeing you on race day! Weston-super-half’s chosen charity this year is Macmillan Cancer Support.